Basil is a member of the Mint family, and like most other mints, is mainly used in medicine for its digestive and anti-gas properties. Herbalists also recommend it for stomach cramps, vomiting, constipation, headaches, and anxiety. 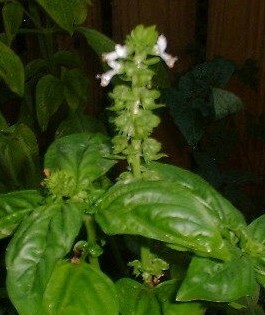 Basil is usually made into a tea for medicinal purposes. Please see How to Make Herbal Teas on this site for instructions on how to prepare Basil Tea. Try a cup of tea after dinner to aid the digestive process. There is also some evidence that Basil has somewhat of a sedative effect, so drink some tea after particularly stressful days for relaxation purposes. Basil leaves can also be dried and ground into a powder for use in herbal capsules, which is more convenient when working or otherwise spending time away from home. Please see How to Make Herbal Capsules for more information.